The budget model Weslo CrossWalk 5.0t treadmill has a small treadmill belt, a manual incline, a heart rate monitor — and some serious quality control issues. The price is inviting if you are on a budget but this is not the way to go if you want to get in shape. The LCD display readout on the Weslo CrossWalk 5.0t treadmill tracks speed, time, distance, pulse, and calories burned. The four pre-programmed workout apps automatically adjust the speed of the treadmill while you walk. UPDATE: The Weslo CrossWalk 5.0t is no longer available. 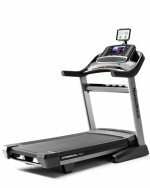 Check out the 5.2T as well as the popular Cadence models here for great deals on all of these treadmills. Weslo lists the motor of the CrossWalk 5.0t as a 2.25 hp motor but it isn’t continuous duty horsepower, what all treadmill motors should be rated at, it’s a peak horsepower rating. The actual continuous duty rating may be more like 1.25 hp so don’t think the motor is going to hold up for long if a 250-lb user is strolling at a 1 to 2 mph pace several times a week. Nothing burns up a motor faster than pulling the belt at the lowest setting with a normal size or larger adult walking on it. On the plus side is that Weslo didn’t try to put a cheap power incline on this machine so that’s one less part to break down. Another point to mention about the Weslo CrossWalk 5.0t treadmill is the deck cushioning – there’s really nothing there so don’t be fooled. 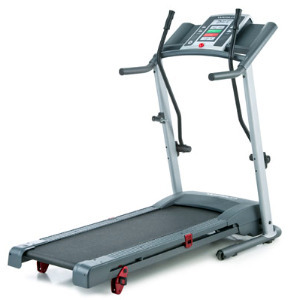 Treadmill reviewers have noted that the deck doesn’t feel solid at either the level or elevated position, so again, it isn’t just the small motor problem; the weak deck means that any potential buyer should not weigh more than 160 pounds. The heart rate monitor is a nice feature – simply place your thumb on the Easy Pulse™ sensor located on the console. It doesn’t actually work, but hey, it is a nice feature! If you like a flimsy frame, lots of plastic, a restrictive walking area, cheap deck, weak motor, short 90-day warranty, and notoriously bad customer service, this is your baby. What’s not to like about wasting $299 on the Weslo Crosswalk 5.0t treadmill? Take a tip from current and former owners of this Weslo model and skip it altogether.